The number of social messages needing a response from brands has increased by 18% over the past year, according to the Q2 2016 Sprout Social Index. Even though consumer expectations are on the rise, brand response rates across industries are declining. In fact, less than 11% of social messages receive a response. Looking at the banking and finance industry in particular, nearly half (46.4%) of incoming messages require a response. However, only 13.4% of consumer messages to financial brands needing a response actually get one. This leaves a lot of room for improvement. Up until recently, privacy and compliance concerns deterred financial brands from being more social online, but that all changed when the Federal Financial Institutions Examination Council (FFIEC) released guidelines on how to increase your social presence while reducing risk. Before we dive in to some of the compliance and regulations that apply to banks, credit unions and so on, we should note this is specific to US-based financial institutions. Check with your local government to see which regulations apply to you. Running a social media contest is a popular marketing across industries. And while there are platform-specific rules you need to consider, financial institutions also need to abide by another set of regulations. Section 5 of the Federal Trade Commission Act deals with unfair, deceptive or abusive acts or practices. It states that messages published on social media must not mislead or be deemed unfair. Simply put, you need to ensure the information shared is both accurate and consistent with information published elsewhere. It seems like there are hundreds of contests and sweepstakes on social media each day, but there are a lot of legalities that play into them. Be sure to consult with your legal team or compliance officer before launching a campaign. This will ensure you’re compliant with platform, industry and local government rules. Data lies at the heart of your marketing efforts. Everything from building your target audience to measuring the success of a campaign hinges upon it. But even when you’re not actively collecting it, financial brands still need to be aware of how they’re interacting with user data. Social platforms provide demographic data for their users. Facebook, for instance, has a wealth of demographic data about its user base. Financial brands need to be careful how they handle this data. According to the Fair Lending Law, you cannot improperly collect the information, use the information or give the appearance that you’re using such information. Additionally, in accordance with the Fair Housing Act, any mortgage lenders with a Facebook Page must display the Equal Housing Opportunity logo somewhere on their Page. 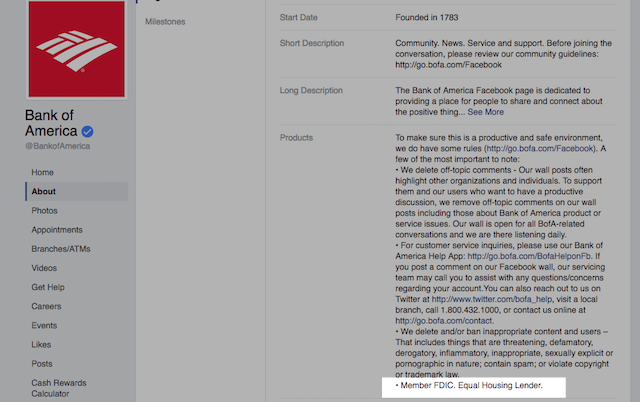 Bank of America, for example, added a brief disclaimer to the About section of its Facebook Page. It’s unclear whether this is in compliance, so once again, we recommend consulting with your legal team. Did you know that 99% of Americans have cell phones, but we’re speaking less than ever before? Twenty-six minutes per day are spent texting while only six minutes occur on calls. When it comes to conversing with others, 25% of people socialize more online than in person, 32% would rather text than talk and 51% of teens would prefer to communicate digitally than in person. With so much emphasis placed on digital communication today, it’s no surprise that even debt collectors turn to social media. The medium spans generations, locations, incomes and so on. With such a large group of people ignoring phone calls and favoring digital communication, creditors have to adapt—but not without restrictions. The Fair Debt Collection Practices Act (FDCPA) states that financial institutions and their third-party debt collectors must comply when using social media to contact a delinquent customer. For example, you cannot publicly disclose that a consumer owes a debt. Writing about a debt on someone’s Facebook Timeline may violate the FDCPA. You also can’t use social media to inappropriately contact consumers, or their families and friends. Fortunately, financial brands don’t have as tight of regulations around advertising as other industries. For example, marketers promoting alcohol brands have age restrictions to deal with. Other than being mindful of the language and terminology used in your promotions, another regulation you must comply with is really just a disclaimer. For NCUA insured companies, you must display the official advertising statement—“Federally insured by NCUA”—in all of your advertisements. If you’re a FDIC insured business, you must include the official advertising statement—“Member FDIC”— in each advertisement. These statements must be clearly legible and at least as large as the smallest font sized use in other portions of the advertisement. When it comes to communicating with a brand, 9 out of 10 people have used social media. And for 34.5% of people surveyed, social media is their top choice for customer care. Those incoming messages can vary in sentiment. In fact, 36% of people have used social media to shame a business for poor customer service. Good or bad, you may want to retain your own records. To help with this, Sprout Social retains social records for the duration of your subscription so you don’t have to worry about archiving. 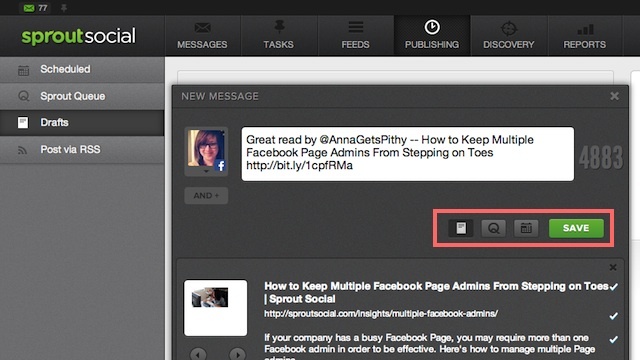 You can draft and publish messages as well as export your records as needed. Under the Community Reinvestment Act, financial institutions are required to keep a record of complaints and comments from the public that relate to the institution’s performance in helping the community meet its credit needs. This is a tall order for businesses using social media. 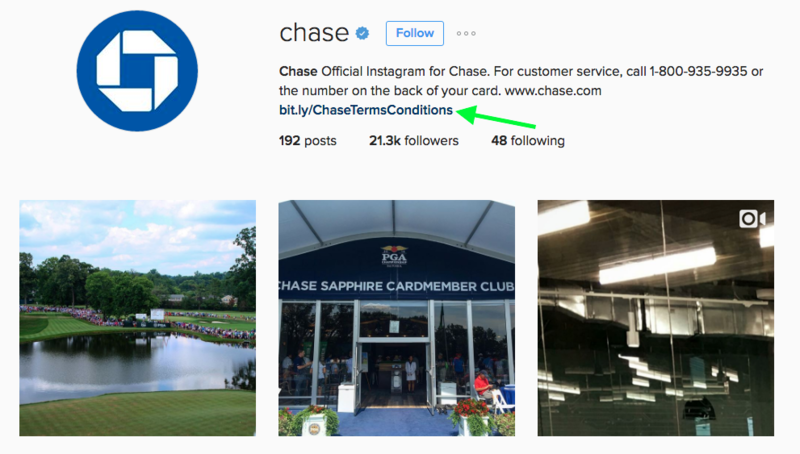 Required or not, social listening is important for businesses using social media. It makes your engagement more efficient and effective. Social listening gives you a sense of the general sentiment around your not only your brand, but your product and competitors as well. Additionally, it’s good to monitor the content people post, especially on platforms used for customer support. At no time should personal account information be shared via social media. There are a number of other acts and regulations to be aware of. For a full list, read the Consumer Compliance Risk Management Guide. If you’re a financial institution located outside of the US, check with your government for specific regulations that may apply to you. Advertising is a big part of your social media strategy and you need to be familiar with the different tools on each platform. Acorns, a financial service app that helps people invest their money, skillfully navigated Facebook’s advertising offerings and ended up attributing 33% of its investors to Facebook app ads. Using Facebook’s Custom Audiences and Lookalike Audiences targeting helped build an audience of people who were already engaging with the brand on its Facebook Page. Then using Audience Insights, Acorns determined the age, gender and location of its audience, and targeted the first set of ads to this segment. Don’t be afraid to experiment with other social networks. Twitter and Facebook are great, but you have to go where ever your target audience socializes. 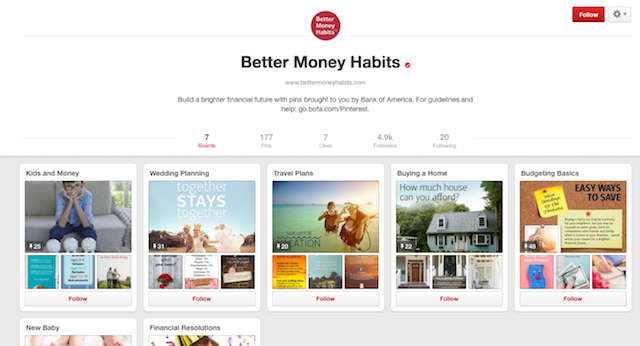 Bank of America looked to Pinterest to help promote its Better Money Habits site, which targets individuals going through “financial firsts,” which is a big subject for millennials. With 34% of its users between the ages of 18 and 29, this pairing wasn’t an accident. Bank of America created boards for different life moments, like buying a home and travel plans. The company filled each with relevant Pins that directed viewers to educational content on the campaign’s website. In less than five months, Better Money Habits reached nearly 6 million people and generated more than 29,000 saves. Credit unions face unique challenges when it comes to social media. Unlike banks, which are open to everyone, credit unions have a very specific customer base. But smaller, more targeted audiences won’t limit your success. In just over a year, the Navy Federal Credit Union increased its Facebook Likes from 22,000 to 770,000 and daily reach went from 4,692 to 896,782. What was behind this spike in social media engagement? Its members. The credit union asked its members to create “Tell Your Story” videos and submit them to Facebook for a chance to win a cash prize. The campaign was promoted using Facebook Ads. The six-week campaign returned more than 60,000 new member acquisitions. The photo/video contest has evolved with the recent launch of #JoinTheFamily. Granted the NFCU isn’t your small, local credit union, and not everyone will share its budget. But the strategies it employed serve as inspiration to others even if you can’t afford to run ads or offer up a hefty prize. The goal behind any social media strategy should be engaging with customers, and that’s something Sallie Mae does well. Best known for student loans, the company regularly interacts with followers on Twitter—often unprompted. It also participates in Twitter chats, which is a great way to promote yourself to a new audience, drive brand awareness and establish yourself as a leader in the industry. Don’t let compliance issues scare you away from being active on social media. Get your accounts set up and know your limits. Also look for fun ways to branch out and reach new audiences. This should be a fun experience for everyone involved. Today 74% of online adults use social media, but only 27% of companies have a social media policy in place. Make sure your employees’ social media usage doesn’t have a negative impact on your business. A social media policy is a code of conduct that provides guidelines for employees who post content online as either part of their job description or personal brand. The goal of a social media policy is to set expectations for appropriate behavior online and to protect employees from legal issues or social media crises. Learn everything you need to know about this process in our previous article: Your Guide to Creating a Social Media Policy. Things go wrong. Social accounts are hacked. Confidential information is leaked. Products are recalled. Disgruntled customers take to social media to vent or just to be trolls. Marketing and communication teams need to be prepared to handle a social media crisis of any size. You need to a set planso you’re not caught off guard when the time comes. By downloading our guide, you’ll learn how to incorporate your entire organization into crisis planning, as well as how to alleviate customer concerns before things get out of control. This ties in a bit with creating a social media policy. Your employees are your best brand asset. They’re knowledgeable about the product or service and they’re passionate about the industry. Whether they’re sharing content through a branded handle or just building a personal brand, your employees need to be prepared. Are they aware of your social media goals? Do they know how to handle customer service requests? Before you hand over the keys to your social media accounts, educate your employees about the protocols and regulations that they must follow. By giving them the tools to be great ambassadors for your business, you help extend your reach in ways marketing teams can’t.